Thereâ€™s no flour in this breakfast 'cake â€“ the base is just pumpkin and egg whites. 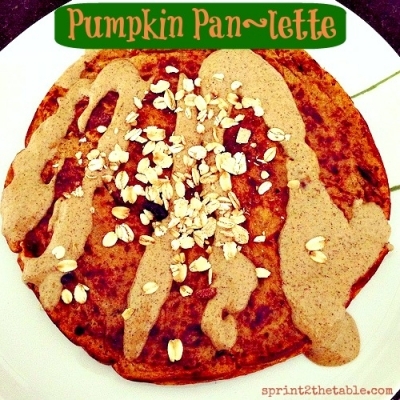 Like a pumpkin omelette, but cooked like a pancake. Pan-lette. Get it? Whatever you call it, it is a fluffy cake of fall deliciousness. Combine all pancake ingredients into a medium bowl and stir until smooth. Pour into a prepared (I used PAM) skillet and cook as you would a pancakes (~2-3 mins on each side). Note: I made this as one huge pancake, but Iâ€™d advise you to turn it into 2. It required some serious acrobatics and two spatulas to flip. Meanwhile, stir together sauce ingredients in a small bowl. Plate your pie-cakes, top with peanut butter syrup (that recipe is on the blog post), and enjoy!